Is it just us, or is it super hard to find the perfect skirt? We always seem to fall in love with skirts that are either too short, too tight across the bum or that we just don’t feel comfortable in once we’ve tried it on. After searching for the dream skirt for quite some time now, we’ve both managed to find one which ticks all the boxes for us, finally!! There’s still a few weeks of Summer left and these two skirts are perfect for the season. Of course we used our August Outfit of the Day post as an excuse to showcase them, because they’re too nice for you guys to not see! We really love doing OOTD posts every month, as they allow us to get out and explore pretty locations to take photos in and sometimes we even find local places which we never even know existed. Sometimes it can just be good to put some nice clothes on and head out for some fresh air. We can only hope that we can still find time to do this once September hits and we go back to our usual busy lives. One of the biggest trends we’ve been seeing over the last couple of months in the shops, on blogs and all over Instagram is the ‘off the shoulder’ trend. Lately we’ve been finding so many amazing jumpsuits, playsuits, tops and dresses and they’re all off the shoulder. This bardot trend is everywhere so it’s clearly one that a lot of people have been loving! It is a trend that has taken the stores by storm but unfortunately for us, we aren’t too keen. Yes we do know it’s probably an incredibly unpopular opinion but we do have our reasons so stick around and let us explain! After coming back from our week away with the boys (we filmed some vlogs if you want to see them – part 1 & part 2), we feel like we haven’t really done much. We’re trying so hard to save all of our money for our trip to Florida that our time is mainly spent at home or doing some ‘window shopping’ in town. We finally decided that enough was enough and ventured out to take some blog photos and so here we present to you our July OOTD (yaaaaay!!). We missed out on our June Outfit of the Day so it feels so good to get this post up! Today we are taking it back to the very basics with two of our favourite colours, black and white. Black probably isn’t the most ideal colour to wear in July when the sun is shining, although we love the sophisticated yet casual look it can give and we’re bored of wearing bright summer colours now anyway! Fashion is our favourite thing to write about on our blog. We love writing about any new items that we’ve bought or even just showing how we style bits that have been in our wardrobes since we can remember! But being a fashion blogger involves posing in front of the camera and trying to look cool…Something we’re not too good at! Every single time we brave it and step outside of the house to get photos there are certain thoughts that run through our minds. If you’re a fellow fashion blogger we really hope that you can relate to some of them! There have been SO many trends lately from embroidery to gingham, but we thought we’d take it back to basics with today’s post. Polka dots and stripes have always been some of our favourite patterns and it seems like they aren’t getting as much attention lately! A few days back the sun actually decided to make an appearance, so we rushed out to take some blog photos as we wanted to show you two different outfits that show how to style both spots and stripes. What side are you on? Do you prefer delicate spots or bold stripes? Or maybe you’re up for trying all the different trends! At the start of the year we made it our goal to post more fashion posts on our blog, as they’re our favourite type of post to write! So here we are with our 5th fashion post of the year, that’s pretty good for us right?! Anyway, it’s now April and the weather here in England is starting to get a little warmer so the jumpers have gone away. That being said there’s still a cool breeze in the air and one way we’ve made sure to stay warm is by layering our clothes. 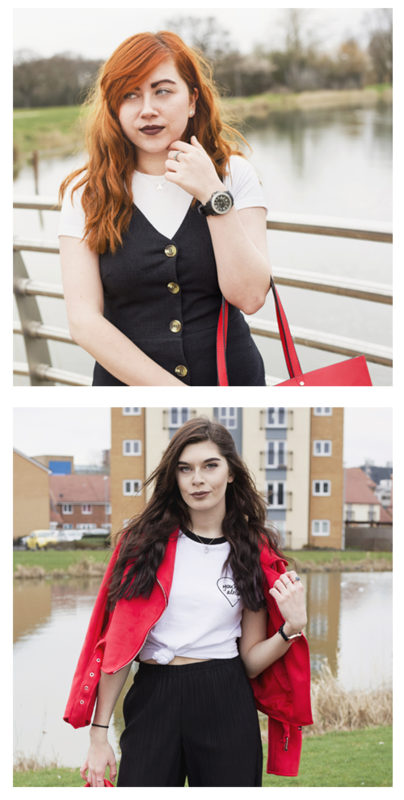 We love the look of layered clothing so we thought we’d show you how we’ve been styling the majority of our clothes lately!